Overview. As a pointy-headed university professor, my weekend project of bridge photography and building these web pages generated many questions and introduced me to just-in-time learning. I enjoy chasing my curiosity and want to identify ways to encourage younger learners to also enjoy curiosity chasing and learning. Learning usually requires repetition while forgetting occurs when I infrequently use information. Many young learners do not understand the importance of repetition. Weekly visits to the bridge provided the repetition necessary to detect changes in the bridge and consequently generated many questions and opportunities for learning. Over the course of the bridge project, I had access to few experts for answering questions. Rather than a liability, this became an asset and pushed me to improve my search skills with Google. Soon, I found that answers to questions encountered during my weekly photo shoots were often only a Google-search away - (see Restoring the Joy in Learning). Consequently Google + Internet became dependable extensions of my memory. The bridge story is a work in progress and is evolving from a simple collections of photographs to an experiment with Internet-centric just-in-time learning. Insights I gain from you will find their way into the learning centers of MUSC. Palmetto Bridge Constructors, a joint venture between Tidewater Skanska and Flatiron Constructors, as well as High Steel Structures, Freyssinet, the SCDOT and the Federal Highway Commission Office of Bridge Technology guided much of my learning. I also learn from many of you and from Google-linked resources. More important is the e-mail encouragement I receive from many of you. As many of you know, these bridge photo essays started as a simple way for my grandchildren to watch the growing of the new Cooper River Bridge. Sometime in the early spring of 2004, Bill Mankin of High Steel Structures, sent me email with some comments about the web site. 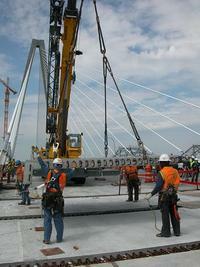 High Steel fabricated all the edge and floor girders for the main span. Bill's email and our subsequent exchanges changed the web site from a Read Only web page to an interactive Read Write web site that reflected information from our web page community. Bill helped me understand some of the issues associated with erecting the steel girders and later invited me to visit their facility in Lancaster Pa. Many engineers and many more armchair engineers have joined our conversation. When I encountered puzzles, many were quick to respond with answers. For example Joe Krolak, an hydraulic engineer with the Federal Highway Administration, Bridge Divistion, helped me understand how one stabilizes barges that support cranes while erecting girders while Boyd Gregg, a civil engineer with Black & Veatch in Alpharetta, Ga helped me understand the concept of tensioning - specifically when I encountered PBC tensioning the lateral tendons that stabilized the central segment of the east and west pylons. So I copied and pasted Boyd's explanation into the details web page. When I really got into engineering trouble, David Wertz with SCDOT and Marvin Tallent with PBC helped me understand what was happening. More recently, Peo Halvarsson provided opportunities to explore different aspects of building the main deck and Oliver Forget with Freyssinet helped me understand erecting cable stay pipes and pulling strands of cable. I had a chance to see many things that simply increased my curiosity. During these times, I met Wilbur Poole, an iron worker who also manages the hydraulic systems used to position the deck. All these folks were my teachers and I transferred what I learned to these pages. But many many people simply sent email to encourage me to continue. These are the people that energized me to continue my weekly visits to the SC Aquarium to take my "core data". Then Tina Cotter got into the picture. Her husband, Philip, an iron worker, named one of the deck erection cranes "Last Dinosaur Standing", the kind of humor that really turns me on. When Tina told me the crane story, I could not resist adding some humor to the placement of the last concrete floor panel - was Philip signaling the crane operator, or was Philip secretly waving to Tina? Look at the photo above and you be the judge. What I am trying to say is that this web site is a community project - not just Frank Starmer taking photos for his grandkids. The stories and photos reflect significant influences from two of my kids - Michael told me a long time ago that my photos were chaos. "Never take a photo unless you are prepared to tell a story". Not only good advice, but great advice. Josh then introduced me to the humor side of photo essays with his dialog associated with photos of my work in south India (2001). Gene Stead, chairman of Medicine at Duke, was my first boss and taught me the joy of learning. Gene asked lots of questions - not because he was testing people, but because he was curious. Gene helped me to understand that being curious was OK - not something that should be suppressed as one becomes a teenager. My dad was also very curious and shared with me that he never met someone from whom he could not learn something. The Internet and Google level the playing field for all of us curiosity chasers. And these web pages are really an experiment in what I call Internet-centric learning. The days of teachers and students are nearing an end and a new Internet-centric learning paradigm is evolving. As with Gene - we are all learners in this world - traditional teachers are more like senior learners while traditional students are simply junior learners. So these web pages are all about learning, my curiosity and your encouragement. What started as a simple set of photos has evolved to what we have now - a sort-of read write web site where many of you contribute to my understanding aspects of building the new Cooper River Bridge. I am grateful for your help, for your curiosity and for your encouragement.